​Reading during the summer months broadens a boy’s horizons like few other activities. ​With this end in mind, I am happy to provide you with the Avalon School’s Summer Reading and Poetry Requirements. All boys at Avalon will be required to memorize one poem over the summer months to recite in September when school begins. Each poem is likely found on the internet or in many poetry collections. The reading requirements involve more effort. Each boy entering lower or middle school grades is required to read two of the listed works for the grade he is set to enter in September. 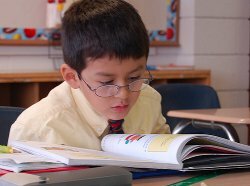 No other assignment will be required of boys entering grades 2 through 6, but literature teachers will ask the student which books he read. Boys entering grades 7 and 8 must write a single page, double-spaced review of one of the books read explaining why—or why not—he thinks the book was a worthwhile read during the summer. This essay should be turned in to his English teacher no later than Friday, September 9th. Requirements for boys entering upper school grades reflect their growing capabilities. Each boy should read three books from the list, and write a review of two of the books. Please note that, while we still require a review of two of the works, we ask for two separate reviews. Each review should be a single page of double-spaced text. Although some summary of the work is necessary, the review should primarily be a critique of what was enjoyable and successful in the work and what was not. These essays should be turned in to his English teacher no later than Friday, September 15th. If you know of other quality, age-appropriate books that boys will enjoy, we would be happy to keep them in mind for future summer reading lists. Canticle for Leibowitz, Walter M. Miller, Jr.